A couple of weeks ago my sister sent me an email in the middle of the night. I guess she had one of those nights when she couldn’t sleep. She wanted to tell me that I should make a white chocolate mousse and put the recipe on my blog. You know the nights that I can’t sleep and I am lying awake in bed… I will be thinking about food. I don’t know about you but those nights are when I come up with my best ideas. Well back to the white chocolate mousse. That email from my sister really got me thinking about white chocolate mousse and once something is in my head I can’t stop thinking about it until the task is completed. I have a real simple recipe for chocolate mousse so I decided to adapt it for the white chocolate mousse, but I had to dress it up a bit with a little homemade granola and some caramelized blueberries. The white chocolate mousse is really simple to make, but one thing you have to be careful with is melting the white chocolate. If you try to melt it too quickly it will get funny, I guess I would say that it kind of curdles and if that happens all you can do is throw it away. 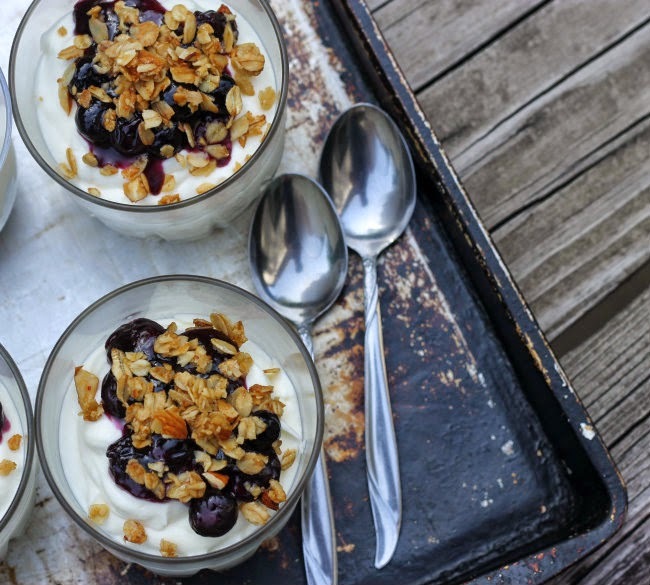 The mousse itself is light and fluffy, the granola adds just a bit of a crunch, and the blueberries bring the whole dessert together. I served it the day that I made the lasagna and the buns from my last post, on our son’s birthday along with Jell-o cake (the birthday cake that our son requested). The mousse was the dessert of choice; the birthday boy was the one who enjoyed the cake, the rest of us enjoyed the mousse. 2. In a medium bowl mix the rolls oats, brown sugar, and chopped almonds until well blended. 3. Pour in the melted butter and honey, with your hand mix until butter and honey coat all of the oats. 4. Spray baking pan (jelly roll pan) with non-stick cooking spray and pour granola onto pan. 5. Place in the preheated oven and bake for 15 minutes, stirring after about 7 minutes. 6. Remove from oven and set on cooling rack to cool completely. 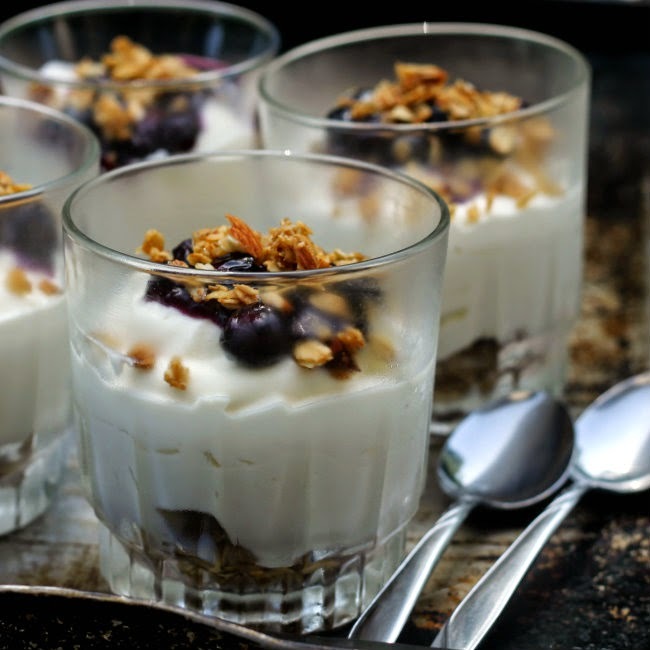 Once it is cooled in can be divided into 8 glasses and set aside until the mousse is completed, save 1/2 cup of the granola back to sprinkle over top of the dessert. 1. To a small sauce pan add the 2/3 cup of cream over medium low heat bring the cream to simmer. 2. Once the chocolate comes to a simmer add the white chocolate chips (make sure that the cream is not hot the chocolate will not melt correctly). Stir occasionally until chocolate is melted, if a there are some small pieces of chocolate that don’t melt that will be okay. Set aside and cool. 3. In a large bowl add the 1 3/4 cups of whipping cream, powder sugar, and vanilla. Beat until soft peak form. Once the whipped cream is complete pour the melted white chocolate into the whipped cream and fold in. 4. Spoon the mousse over the granola dividing it between the 8 glasses. Set in the refrigerator while the blueberries are being prepared. 1. Over medium heat melt butter along with the sugar in a medium skillet. 2. Once the butter is melted add the blueberries. 3. Stirring constantly cook the blueberries until they are soft and slightly broken down, about 5 minutes. 4. Set aside and cool completely. Once cooled spoon the blueberries over the mousse. 5. Sprinkle with the remaining granola. Top with sweetened whipped cream if desired. I can see why this would be the dessert of choice. 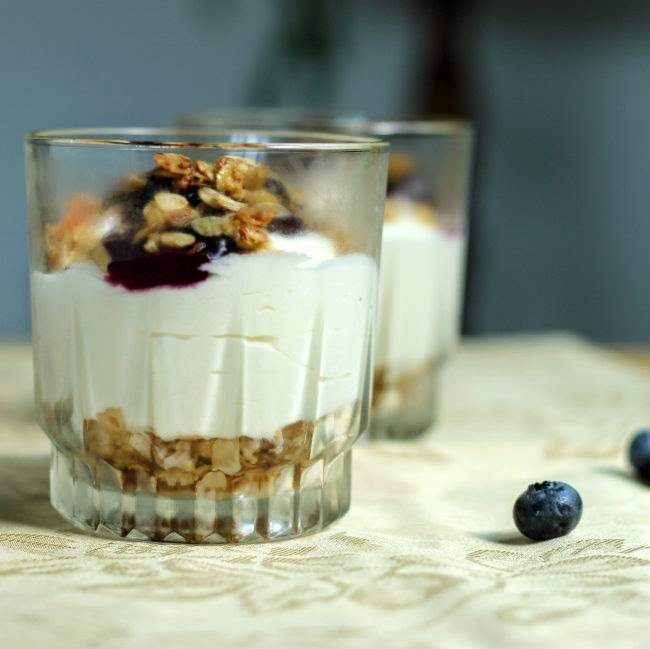 Not only does it sound great but it is a pretty dessert as well topped with the granola and blueberries. Que buenos con ese crujiente. Your sister obviously has very good ideas in the middle of the night. White chocolate mousse sounds glorious. So rich and delicious. Being a white chocolate lover this sounds dreamy! I would of chosen this too! 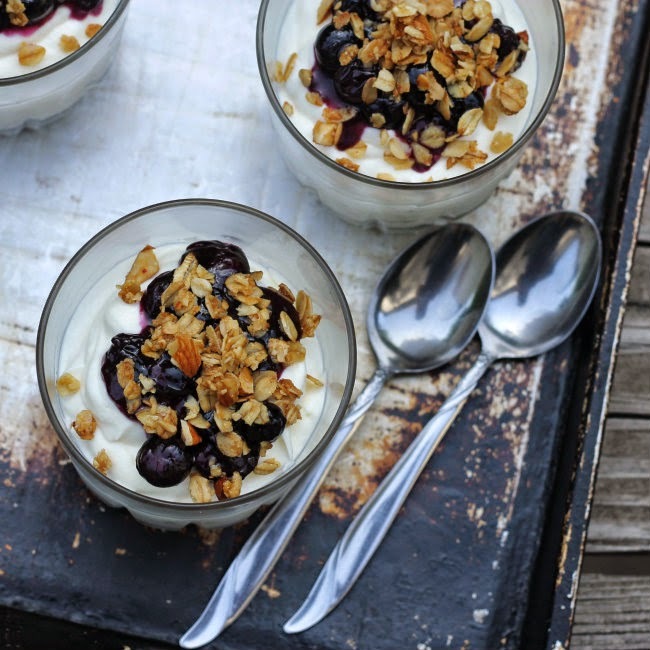 Perfect with the blueberries and the crunch of the granola. Haha…you should get your sister to email you in the middle of the night more often…this looks amazing! !